Almost everyone is familiar with the universal means of mediation known as Rock, Paper, Scissors – a game played by children and adults alike in order to solve their petty differences with tactics akin to pure chance. Most know about this game, but few realize the political symbolism involved. Politics, especially the contemporary, is defined by symbolism – mainly that of hand gestures. For the last century, statesmen, politicians, revolutionaries and even intellectuals have created an image around their ideals with a hand gesture and symbol. Modern politics as we know it is defined by three archetype ideologies. These are: Freedom, Populism and Oppression. Under Freedom we have the ideals of Capitalism, Liberty, civil liberty, democracy and constitutional law. 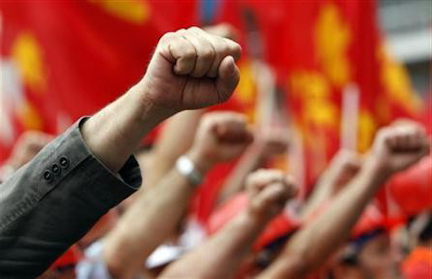 Under Populism, the collectivist beliefs of Communism, socialism and the ideals pushed forward by many trade unions and Leftist revolutionaries. The last, Oppression, is that of Fascism, Jingoism and totalitarian society. So, you ask how these ideals relate to the aforementioned game. The reasons are the gestures themselves and how they connect. Paper – a gesture reminiscent of the Nazi salute (and previously that of the Romans). Rock – a common sign used by populists and collectivist leaders alike. And finally, scissors – a symbol for peace and an iconic symbol of Winston Churchill, a large advocate for Capitalism and Democracy. Each of these symbols are similar in imagery to the very real and political signs which we see in the news and history books every day; but the similarities between the game and politics do not stop there. The rules of Rock, Paper, Scissors are also related to the phases and nature of political ideals themselves. Scissors, a symbol of a free society, are easily destroyed by Rock, the symbol of Populism. This is due to the fact that Populism appeals to a vast majority of the population. Workers, the poor, the military and even many intellectuals see the Populist ideologies as the correct method in which our societies should be shaped. And thus, with these numbers, a free society may turn to a collectivized one where good intentions lead to nationalization, socialization and the inevitable rise of Karl Marx’s ideas. But the Rock is flawed, for the corruption of Paper soon finds a way to take over and smother what Rock once stood for: paper – dictatorship, fascism, militarism, totalitarianism, an ideal represented by the likes of Adolf Hitler, Josef Stalin and Pol Pot – Evidence of a dream destroyed. Rock is a dream, but Paper is the harsh reality which covers that dream, the dark ambitions of a few with the power to halt a Populist system which, through naivety and good intentions, has paved the way to hell. But Scissors still remain to triumph over Paper. For freedom does eventually reign over that of Oppression. Eventually, through chaos, revelation or reform, society will force itself to once again become free. Only Freedom can defeat Oppression. And even though revolutions may end these societies which many have grown dissatisfied with, these acts of violence for change will always be hijacked by darker goals, eventually being defeated once again by true liberty. This cycle goes on and on throughout history. Symbol replaces symbol and ideals may change – but the game never changes. Interesting article 🙂 Whenever I play rock-paper-scissors again, I will always remember the political symbolism that it can be connected with.